One thing I’m trying to do with my blog is to provide useful pointers, into the vast amount of material that’s available both online and offline, to the small small fraction of that material which does the best job of summarising, extending, and challenging current thinking. “Whole Earth Discipline: an ecopragmatist manifesto“, the recent book by veteran ecologist and environmentalist Stewart Brand, comprehensively fits that criterion. It is so full of insight that virtually every page contains not just one but several blogworthy quotes, ideas, facts, putdowns, and/or refutations. It’s that good. I could write a book-length blogpost signing its praises. Brand turned 70 while writing this book. In the book, he indicates that he has changed his mind as he grew older. The book serves as a landmark for various changes of mind for the environmental movement as a whole. The argument is sustained, easy-to-read, detailed, and compelling. That methods of geoengineering will almost certainly play a part in heading off the world’s pending climate change catastrophe. The book has an objective and compassionate tone throughout. At times it squarely accuses various environmentalists of severe mistakes – particularly in aspects of their opposition to GE and nuclear energy – mistakes that have had tragic consequences for developing societies around the world. It’s hard to deny the charges. I sincerely hope that the book will receive a wide readership, and will cause people to change their minds. It emphasises how objections to people “playing God” are profoundly misguided. We are as gods and HAVE to get good at it. The health of the natural infrastructure is too compromised for passivity. It requires engineering. Romantics love problems; scientists discover and analyze problems; engineers solve problems. As I read this book, I couldn’t help comparing it to “The constant economy” by Zac Goldsmith, which I read a few weeks ago. The two books share many concerns about the unsustainable lifestyles presently being practiced around the world. There are a few solutions in common, too. But the wide distrust of technology shown by Goldsmith is amply parried by the material that Brand marshalls. And the full set of solutions proposed by Brand are much more credible than those proposed by Goldsmith. Goldsmith has been a major advisor to the UK Conservative Party on environmental matters. If any UK party could convince me that they thoroughly understand, and intend to implement, the proposal in Brand’s book, I would be deeply impressed. Note: an annotated reference companion to the book is available online, at www.sbnotes.com. It bristles with useful links. There’s also a 16 minute TED video, “Stewart Brand proclaims 4 environmental ‘heresies’“, which is well worth viewing. Thanks to Marc Gunther, whose blogpost “Why Stewart Brand’s new book is a must-read” alerted me to this book. By a fortunate coincidence, Brand will be speaking at the RSA in London on Tuesday. I’m anticipating a good debate from the audience. An audio feed from the meeting will be broadcast live. Over the last ten days, I’ve been reading “Sustainable energy – without the hot air“. The author makes it clear that none of the solutions are going to be easy, and each will require substantial (“country-sized”) changes. 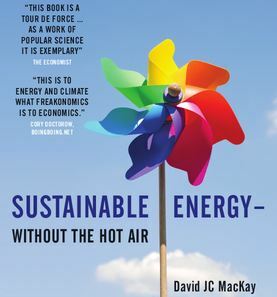 Since publishing the book, the author – David JC MacKay, physics professor at Cambridge University – has been appointed Chief Scientific Advisor at the UK’s Department of Energy and Climate Change – an appointment that took effect on 1st October 2009. Here are two simple individual actions. One is useless, one is very effective. Turning phone chargers off when they are not in use is a feeble gesture, like bailing the Titanic with a teaspoon. The widespread inclusion of “switching off phone chargers” in lists of “10 things you can do” is a bad thing, because it distracts attention from more effective actions that people could be taking. In contrast, turning the thermostat down (or the air-conditioning in hot climates) is the single most effective energy-saving technology available to a typical person. Every degree you turn it down will reduce your heating costs by 10%; and, speaking of Britain at least, heating is likely to be the biggest form of energy consumption in most buildings. We have a clear conclusion: the non-solar renewables may be “huge,” but they are not huge enough. To complete a plan that adds up, we must rely on one or more forms of solar power. Or use nuclear power. Or both. …focusing on Europe, “what area is required in the North Sahara to supply everyone in Europe and North Africa with an average European’s power consumption? Taking the population of Europe and North Africa to be 1 billion, the area required drops to 340 000 km2, which corresponds to a square 600 km by 600 km. This area is equal to one Germany, to 1.4 United Kingdoms, or to 16 Waleses. The UK’s share of this 16-Wales area would be one Wales: a 145 km by 145 km square in the Sahara would provide all the UK’s current primary energy consumption. In the upcoming decades, several global developments will create new challenges for mankind. We will be confronted with problems and obstacles such as climate change, population growth beyond earth’s capacity, and an increase in demand for energy and water caused by a strive for prosperity and expansion. The DESERTEC Concept describes the perspective of a sustainable supply of electricity for Europe (EU), the Middle East (ME) and North Africa (NA) up to the year 2050. It shows that a transition to competitive, secure and compatible supply is possible using renewable energy sources and efficiency gains, and fossil fuels as backup for balancing power. A close cooperation between EU and MENA for market introduction of renewable energy and interconnection of electricity grids by high-voltage direct-current transmission are keys for economic and physical survival of the whole region. However, the necessary measures will take at least two decades to become effective. Therefore, adequate policy and economic frameworks for their realization must be introduced immediately. The role of sustainable energy to secure freshwater supplies based on seawater desalination is also addressed. …the nuclear energy available per atom is roughly one million times bigger than the chemical energy per atom of typical fuels. This means that the amounts of fuel and waste that must be dealt with at a nuclear reactor can be up to one million times smaller than the amounts of fuel and waste at an equivalent fossil-fuel power station. …Japanese researchers have found a technique for extracting uranium from seawater at a cost of $100–300 per kilogram of uranium, in comparison with a current cost of about $20/kg for uranium from ore. Because uranium contains so much more energy per ton than traditional fuels, this 5-fold or 15-fold increase in the cost of uranium would have little effect on the cost of nuclear power: nuclear power’s price is dominated by the cost of power-station construction and decommissioning, not by the cost of the fuel. Even a price of $300/kg would increase the cost of nuclear energy by only about 0.3 p per kWh. The expense of uranium extraction could be reduced by combining it with another use of seawater – for example, power-station cooling. …we must not let ourselves be swept off our feet in horror at the danger of nuclear power. Nuclear power is not infinitely dangerous. It’s just dangerous, much as coal mines, petrol repositories, fossil-fuel burning and wind turbines are dangerous. Even if we have no guarantee against nuclear accidents in the future, I think the right way to assess nuclear is to compare it objectively with other sources of power. Coal power stations, for example, expose the public to nuclear radiation, because coal ash typically contains uranium. Indeed, according to a paper published in the journal Science, people in America living near coal-fired power stations are exposed to higher radiation doses than those living near nuclear power plants. …the volumes are so small, I feel nuclear waste is only a minor worry, compared with all the other forms of waste we are inflicting on future generations. At 25 ml per year, a lifetime’s worth of high-level nuclear waste would amount to less than 2 litres. Even when we multiply by 60 million people, the lifetime volume of nuclear waste doesn’t sound unmanageable: 105 000 cubic metres. That’s the same volume as 35 olympic swimming pools. If this waste were put in a layer one metre deep, it would occupy just one tenth of a square kilometre. There are already plenty of places that are off-limits to humans. I may not trespass in your garden. Nor should you in mine. We are neither of us welcome in Balmoral. “Keep out” signs are everywhere. Downing Street, Heathrow airport, military facilities, disused mines – they’re all off limits. Is it impossible to imagine making another one-square-kilometre spot – perhaps deep underground – off limits for 1000 years? …the assertion that “civil nuclear construction on this scale is a pipe dream, and completely unfeasible” is poppycock. Yes, it’s a big construction rate, but it’s in the same ballpark as historical construction rates. So far, I haven’t found any significant criticism of the points made in this book. It’s highly recommended. You may also enjoy David MacKay’s blog. Footnote: for further reading on nuclear energy, take a look at “10 reasons to support nuclear power“; and for more about Desertec, see their FAQ. In the past, I’ve enjoyed several meetings of the London Skeptics in the Pub (“SitP”). More than 100 people cram into the basement meeting space of Penderel’s Oak in Holborn, and listen to a speaker cover a contentious topic – such as alternative medicine, investigating the paranormal, the “moon landings hoax”. What’s typically really enjoyable is the extended Q&A session in the second half of the meeting, when the audience often dissect the speaker’s viewpoint. Attendee numbers have crept up steadily over the nine years the group has existed. It’s little surprise that the group was voted into the Top Ten London Communities 2008 by Time Out. Global Warming: Science, Economics, and some Moral Issues: What Al Gore Never Told You. The science is settled: Evidence clearly demonstrates that carbon dioxide contributes insignificantly to Global Warming and is therefore not a ‘pollutant.’ This fact has not yet been widely recognized, and irrational Global Warming fears continue to distort energy policies and foreign policy. All efforts to curtail CO2 emissions, whether global, federal, or at the state level, are pointless — and in any case, ineffective and very costly. On the whole, a warmer climate is beneficial. Fred will comment on the vast number of implications. Suggestions that global warming is more strongly influenced by cosmic rays than by atmospheric CO2. Result: lots of time wasted, in my view. No one landed anything like a decisive refutation of the speaker’s claims. There were lots of good questions that should have been asked, but time didn’t allow it. I also blamed myself, for not having done any research prior to the meeting (but I had been pretty busy on other matters for the last few days), and for not being able to do my usual trick of looking up information on my smartphone during a meeting (via Google, Wikipedia, etc) because network reception was very poor in the part of the basement where I was standing. In conclusion, although the discussion was fun, I don’t think we got anything like the best possible discussion that the speakers’ presentation deserved. I mention all this, not just because I’m deeply concerned about the fearsome prospects of runaway global warming, but also because I’m interested in the general question of how to organise constructive debates that manage to reach to the heart of the matter (whatever the matter is). As we seek to overcome our reliance on fossil fuels, what are the alternatives? Offshore turbines and wind farms are often cited as options but can they really meet more than a fraction of the UK’s energy needs? If not, is nuclear power a viable alternative? Public anxieties about nuclear plants’ safety, their susceptibility to terrorist attacks, and the problem of safely disposing of radioactive waste persist. But to what extent are these concerns justified? Is the real issue the public’s perception of both the risks and potential of nuclear energy? Ultimately, does nuclear energy, be it the promise of fusion or the reality of fission, finally mean we can stop guilt-tripping about energy consumption? Because of the format, the speakers had the option of ignoring the (few) irrelevant questions, and could concentrate on the really interesting ones. For the record, I thought that all the speakers made good points, but Keith Barnham, co-founder of the solar cell manufacturing company Quantasol, was particularly interesting, with his claims for the potential of new generation photovoltaic concentrator solar cells. (This topic also featured in a engrossing recent Time article.) He recommended that we put our collective hope for near-future power generation “in the [silicon] industry that gave us the laptop and the mobile phone, rather than the industry that gave us Chernobyl and Sellafield”. (Ouch!) Advances in silicon have time and again driven down the prices of mobile phones; these benefits will also come quickly (Barnham claimed) to the new generation solar cells. But the conclusion I want to draw is that the best way to ensure a great debate is to have a selection of speakers with complementary views, to insist on focus, and to chair the meeting particularly well. Yes, collaboration is hard – but when it works, it’s really worth it! Footnote: the comparision between the Skeptics in the Pub meeting and the Spiked one is of course grossly unfair, since the former is run on a shoestring (there’s a £2 charge to attend) whereas the latter has a larger apparatus behind it (the entry charge was £10, payable in advance; and there’s corporate sponsorship from Clarke Mulder Purdie). But hey, I still think there are valid learnings from this tale of two different meetings – each interesting and a good use of time, but one ultimately proving much more satisfactory than the other.